On July 14, Tsering Woeser was able, with some difficulty, to visit Ilham Tohti’s wife, Guzelnur, and one of their two children. 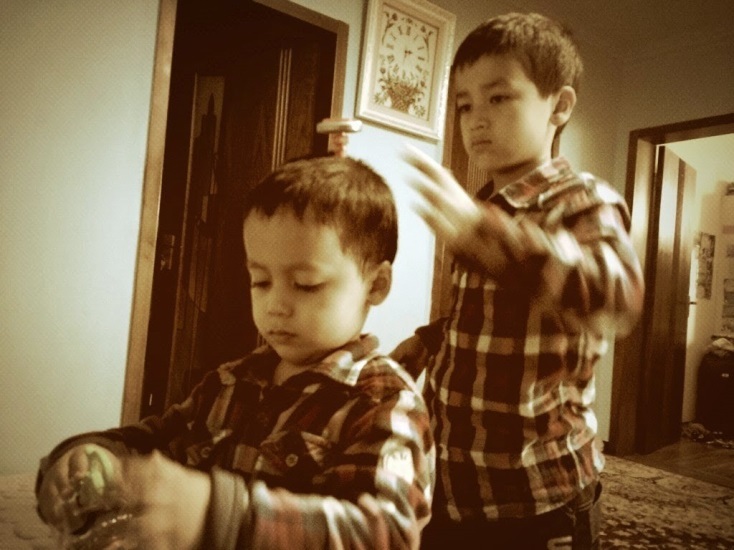 The younger son, age 5, remains with her in Beijing while his older brother, age 7, is in Xinjiang resting and trying to recuperate from the physical toll that months of tension and pressure have taken on him. After returning from her visit she recorded the experience and her feelings on her blog. 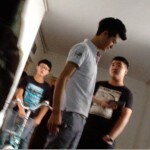 This afternoon I went to Minzu University to see Ilham’s family. As soon as I got off the elevator, four very young men got in my way. At first they said they were property management personnel, but afterwards they said they were from the police station. Their attitudes were quite rude. 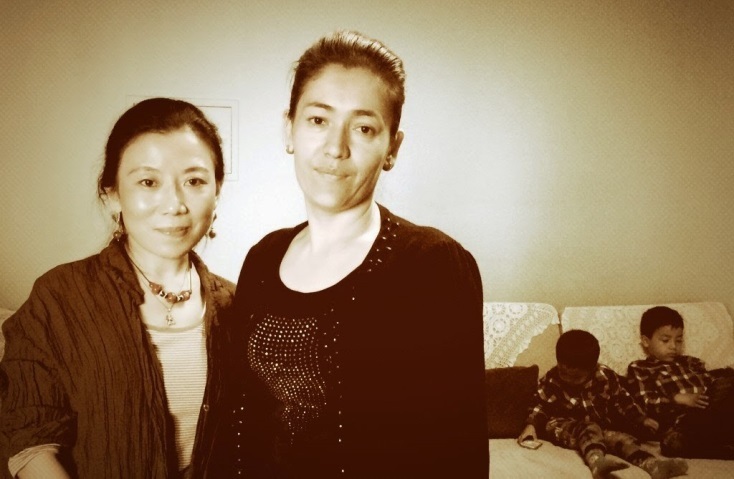 Ilham’s wife Guzelnur heard the noise, and came out and argued with them. They went so far as to make nasty, vicious faces, almost to the point of being rough. 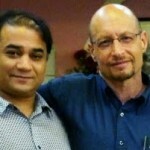 Ilham has been imprisoned for half a year. 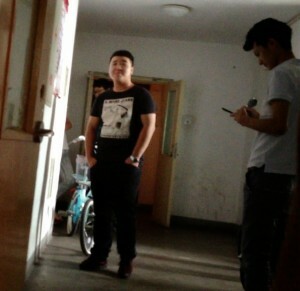 His home in Beijing has been an outpost for the police and for their bullying auxiliaries for half a year. This has put tremendous pressure on the lives and mental outlook of his family; it has produced resentment. People, please: don’t ignore what’s happening here! These two photos show Ilham; his wife, Guzelnur; his daughter Jewher; and his two sons. 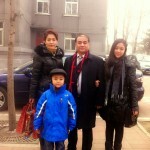 On January 15th of this year more than a score of police brutally arrested Ilham Tohti in front of his two children and took him away to Urumqi to be locked up. When his 7-year-old son thinks of his father he becomes frightened again; he now suffers from an inflamed heart (myocarditis). 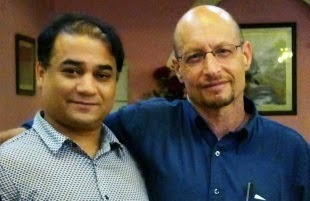 Just recently he was taken by older family members to a village in Xinjiang so he could rest and recuperate. 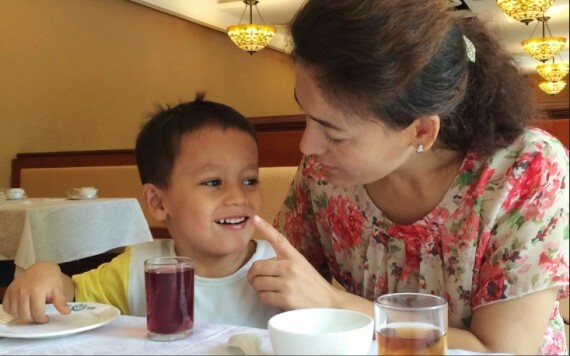 Ilham’s wife Guzelnur has the younger son, 5 years old, living with her at Minzu University. All day long they have to deal with being followed and monitored and with the nasty attitudes of those assigned to them. The young son doesn’t want to go out. He curls up at home, relying on toys and games to dispel his fears. Aside from the few plainclothes police squatting by the door who monitor Ilham’s family, there are several others spread out between the entrance to their building and the entrance to the compound. Following Ilham’s arrest half a year ago the conditions loosened up for a time as the outside world wasn’t paying too much attention. But just recently, because two lawyers went to Urumqi seeking to better understand the case against him, they’ve been beefed up. However, the only ones monitored by these robust and fierce young men are Ilham’s weak and sickly wife and his two young children! 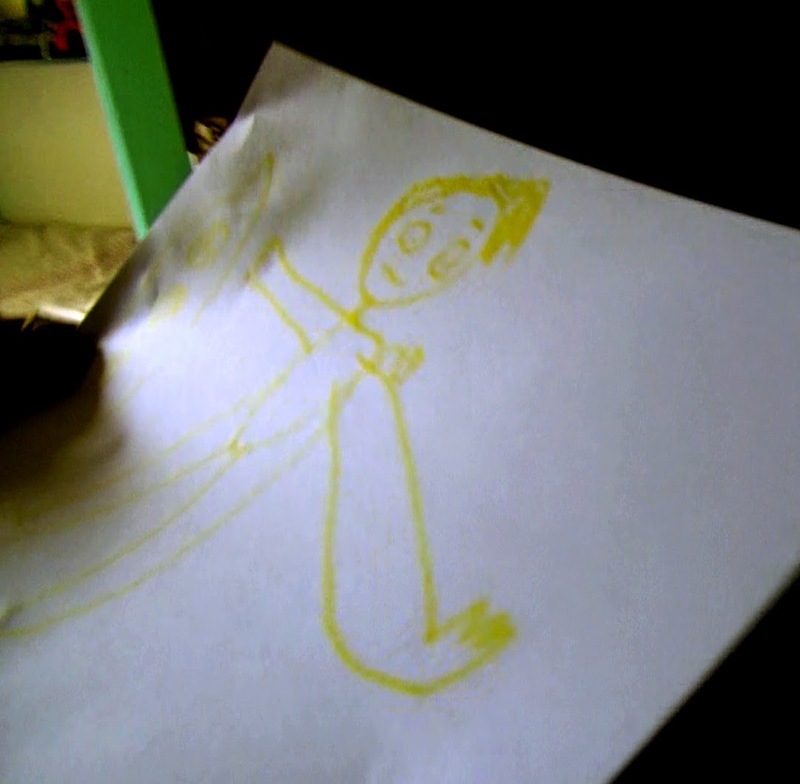 A child spreading his arms as if wanting to fly away, drawn by Ilham’s 5-year-old son. Facing four plainclothes police, Ilham’s wife Guzelnur angrily said “On what basis are you treating us like this? Arrest us too, OK?” After arguing for some time, I finally got into Ilham’s home and saw his 5-year-old son scribbling on a sheet of paper. He was drawing a child spreading his arms as if wanting to fly away. 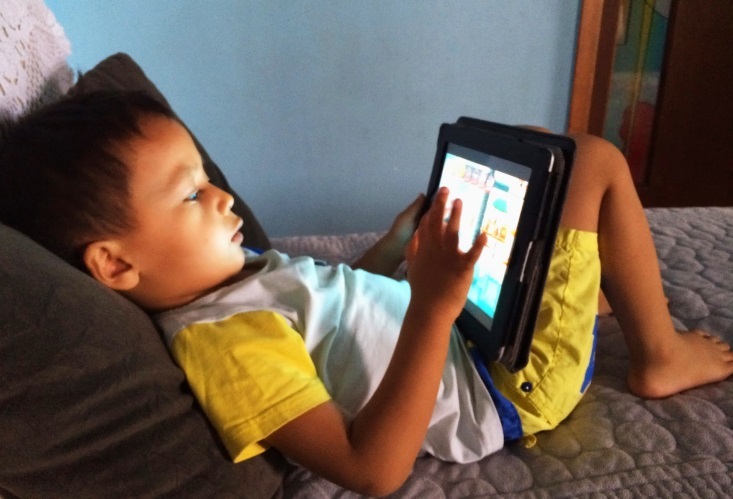 Afterwards he curled up in a corner of the sofa, playing with games. Only when we went out and he drank some Turkish cherry juice did he show us a smile. Me with Guzelnur and her two children. Since I’m a friend of Ilham and Guzelnur, in the half year since Ilham’s arrest I’ve only been to visit her and the children three times. Each time I worried about being blocked at the door; anxious that I would argue with those monitoring them and then, contrary to my intent, increase the pressure being applied to Guzelnur and the children. Each time, when we would say goodbye, I’d hug her, thin and weak as she is, tears flowing inside me. This is too hard: an innocent mother and her children! Several days earlier, Prof. Elliot Sperling, a Tibetologist from Indiana University, was blocked from entering China at the Beijing Airport. This was precisely because of his relationship with Ilham. The Chinese Government is unwilling to have anyone state that Ilham is innocent; unwilling to have anyone reject the trumped-up case that they’ve built around him; and unwilling to have anyone support him. Beyond that, they want to isolate Ilham, isolate his family, and simply make the world forget this tormented man. This time I was able to get through the afternoon without daring to let my tears flow in front of Ilham’s wife and 5-year-old son. Now they fall, in front of my computer. Two children who have lost the companionship of their father. Yes. This is how you rely on toys and games to dispel fear. The plainclothes police squatting by Ilham’s door monitoring his wife and 5-year-old child are all very young. At first they said they were property management personnel, but afterwards they did say they were from the police station. Their attitudes were quite rude. When Guzelnur argued with them, they went so far as to make nasty, vicious faces, almost to the point of being rough.